Patagonia is home to a range of mammals including guanacos, pumas, deer and foxes, in addition to over 100 different bird species. Many plants, trees and fungi are native to the region. Further south, you could add a cruise to the islands in the Magellan Strait, to see the penguin colonies, sea lions and austral dolphins. The Torres del Paine EcoCamp is a unique place to stay in the park, with each bedroom in its own eco dome. Fly to Santiago. Take a guided sightseeing tour of the city. Drive to Maipo Valley for a walk up to El Morado glacier and lagoon. Fly over the Patagonian Andes to reach Punta Arenas. Transfer from Punta Arenas airport to Torres del Paine EcoCamp. Stop for lunch in Puerto Natales and visit the Cueva de Milodon, a cave where the remains of a prehistoric giant ground sloth were discovered. Drive to the western shore of Sarmiento lake, walking down a trail from the road towards the lake edge, where there is plenty of birdlife to observe. Drive to Laguna Azul for a BBQ lunch. Enjoy lunch looking out over the lake, with the three granite towers in the distance. After lunch walk south to Macho Cañon to observe the typical Torres del Paine fauna including guanaco herds. Return to the EcoCamp for cocktail hour. The EcoCamp also offer optional extensions, such as a group or private yoga lesson with one of their instructors. Drive across the park, admiring the mountain views including Paine Grande and Los Cuernos. There's plenty of time to stop and photograph the interesting Andean flora and fauna, such as the Andean condors. Take a boat ride across the lake to Glacier Grey. Visit Salto Grande waterfall, to see the impressive cascading waters falling from Nordenskjold lake into Pehoe lake, walk to Cuernos viewpoint. 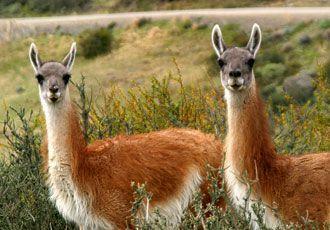 Walk along the Fauna Trail where guanacos, ostrich-like ñandús and maybe the occasional puma print can be seen. Trek to Seron Woods. This involves doing the first part of the 'classic Paine circuit'. Walk through plains and Lenga forests, with a guide to introduce you to the different flora. There are great views of Laguna Azul and Sierra Masle. Transfer to Punta Arenas. There is time to explore the town and shop for last minute souvenirs. Fly to London, via Santiago.